(Vatican Radio) Pope Francis celebrated Mass in St Peter's Square on Thursday to celebrated the feast of Saints Peter and Paul highlighting the plight of persecuted Christians, the importance of prayer and confessing the faith. In a sunny St Peter’s Square on Thursday, Pope Francis was joined by new Cardinals and Metropolitan Archbishops created in the last year, as well as pilgrims and Romans alike, to celebrate the Solemnity of Saints Peter and Paul, Co-Patrons of the eternal city. WITH COMMENTARY - Pope Francis presides over the Holy Mass with the imposition of the Pallium on the Feast of St. Peter and St. Paul. (Vatican Radio) Pope Francis on Thursday prayed for the city and people of Rome, as he gave an Angelus address for the feast of the apostles Peter and Paul, patron saints of the Italian capital. Speaking from his study window to the crowds gathered in St Peter’s Square, the Pope recalled how both of these two apostles suffered persecution and gave their lives in service to the first Christian communities. The liturgical readings of the day, the Pope continued, remind us that even in the most difficult moments of persecution, the Lord remained close to Peter and Paul, just as he remains by our side today. Especially in our times of trial, he said, God holds out his hand and comes to help us, liberating us from the threats of our enemies. At a press conference Thursday morning at the Vatican, Cardinal George Pell, the Prefect of the Secretariat for the Economy, forcefully denied charges of “historical” sexual offences filed against him by Australian police. "All along I have been completely consistent and clear in my total rejection of these allegations," he said. In brief remarks ahead of an official statement by the Holy See Press Office, Cardinal Pell said he has kept Pope Francis regularly informed of the situation. He expressed his gratitude to the Pope for granting him leave to return to Australia to clear his name. Cardinal Pell was critical of media leaks concerning the situation, and lamented the “relentless character assassination directed against him. “I’m looking forward, finally, to my day in court,” the Cardinal said, proclaiming his innocence and denouncing the charges as false. “The whole idea of sexual abuse is abhorrent to me,” he said. Cardinal Müller to Be Dismissed? Reports say prefect of the Congregation for the Doctrine of the Faith will not have his five year mandate renewed on Sunday. Three Vatican sources, including one close to the Congregation for the Doctrine of the Faith, have told the Register this evening that Cardinal Gerhard Müller is to be imminently dismissed as prefect of the dicastery, although the Vatican itself has not officially confirmed the news. If true, an announcement is likely this weekend or on Monday. It went on to note that Cardinal Müller is one of the cardinals who sought to interpret Amoris Laetitia (The Joy of Love), Pope Francis’ apostolic exhortation on the family, “according to a hermeneutic of continuity with the Tradition of the Church.” It added that that had made him a critic of the direction taken by the Pope. 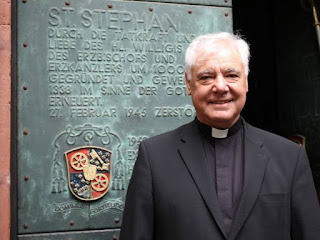 (Vatican Radio) Pope Francis on Saturday named Archbishop Luis Ladaria, SJ, to replace Cardinal Gerhard Ludwig Müller as the Prefect of the Congregation for the Doctrine of the Faith, at the end of Cardinal Müller's five-year term. Archbishop Ladaria is a Spanish Jesuit and theologian who spent many years teaching at the Pontifical Gregorian University in Rome, before being called to serve as Secretary of CDF in 2008. A note from the Press Office of the Holy See released Saturday says the Holy Father thanks Cardinal Müller at the end his quinquennial mandate as Prefect of the Congregation for the Doctrine of the Faith and President of the Pontifical Commission Ecclesia Dei, the Pontifical Biblical Commission and the International Theological Commission, and now calls the former Secretary, Archbishop Ladaria, to take on those roles. Vatican City, Jul 1, 2017 / 04:35 am (CNA/EWTN News).- A consistory is a gathering of cardinals, which the Pope can convoke to give solemnity to a particular decision, or simply to ask his “Senate” to counsel him on an important issue. However, the most recent consistory, held June 28, was rather exceptional. Here are four reasons why. The June 28 consistory was a real surprise: when Pope Francis announced it May 21, there had been none of the normal hints that he was going to call for one. For one thing, there were only a few open “slots” in the College of Cardinals. According to the norm set by Bl. Paul VI and confirmed by St. John Paul II, there can be only 120 cardinals who have voting rights in the event of a conclave to choose the next Pope (the primary responsibility of cardinals). 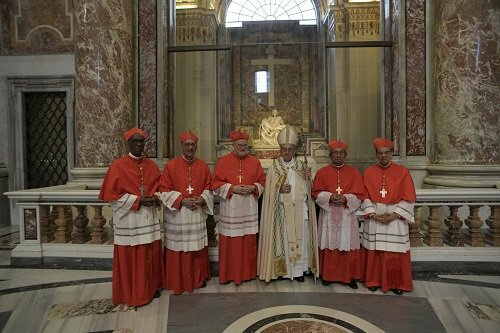 However, Pope Francis made the decision to create five new cardinals, so following this week’s consistory, there are now 121 cardinals with the right to vote in a future conclave, surpassing the normal limit of 120. He is not the first Pope to do so. St. John Paul II created 44 cardinals in the Feb. 21, 2001 consistory. This made 135 cardinals with voting rights, a full 15 over the limit set by Paul VI. The message was read out by Cardinal Pietro Parolin, Vatican Secretary of State. At the end of the message, Cardinal Parolin officially announced that Pope Francis will visit the Rome headquarters of the FAO on World Food Day, 16 October 2017, at the invitiation of its Director-General, José Graziano da Silva. (Vatican Radio) Pope Francis has expressed his “affection and emotion” at the situation of Charlie Gard and “his own closeness to his parents”. ROME - After publicly volunteering to care for UK infant Charlie Gard, whose parents were denied permission to take him to the United States for experimental therapy in a last-ditch effort to save his life, an official of the pope’s pediatric hospital in Rome said Tuesday that the parents have informed her that doctors won’t allow them to do that either for legal reasons. (Vatican Radio) Pope Francis has donated 50,000 Euro in aid for victims of the 12 June earthquake on the Greek island of Lesbos, according to the Apostolic Nunciature of Greece. “It is an unexpected donation and concrete sign of the closeness and affection of [Pope] Francis for the population, which has been deeply tried by the 6.3-magnitude earthquake,” remarked Msgr. Massimo Catterin, chargé d affaires of the Nunciature. This month’s intention is for those distant from the Christian faith: "that our brothers and sisters who have strayed from the faith, through our prayer and witness to the Gospel, may rediscover the beauty of the Christian life." Catholic and Reformed Churches mark ecumenical "milestone"
(Vatican Radio) Another “milestone” in ecumenical relations takes place in the German town of Wittenberg on Wednesday, as the World Communion of Reformed Churches signs up to the Joint Declaration on the Doctrine of Justification. Bishop Farrell recalls that “one of the major problems of 16th century was the theological and spiritual understanding of how the salvation brought by Christ actually takes effect in the life of people”. This “bone of contention” over whether “we are saved by grace, or we are saved by good works” was at the heart of the Reformation. But in the ecumenical process, he says, we have come to see that we have a common understanding, “that we are saved by grace, but that that requires that we show our changed relationship to God in good works”. The original document was signed by Lutherans and Catholics in 1999, with the Methodists signing up in 2006 and the Anglicans due to formalize their adherence later this year. Bishop Farrell notes that this means that “Catholics and most of the historical Protestant Churches now agree on the essence of justification, so we have a much stronger basis on which to build our spiritual and ecclesial relationship”. Bishop Farrell notes that Pope Benedict, who, as Cardinal Joseph Ratzinger, was one of the architects of the 1999 document, defined it as “a milestone in ecumenical relations”. (Vatican Radio) The Vatican’s Pontifical Council for Promoting Christian Unity has released a note regarding the association of the Reformed Churches to the Joint Declaration on the Doctrine of Justification (JDDJ), calling the occasion an “important milestone”. (Vatican Radio) Pope Francis has sent a telegramme upon the death of Cardinal Joachim Meisner, Archbishop emeritus of Cologne, who died on Wednesday at the age of 83. “With profound emotion I learned that, suddenly and unexpectedly, Cardinal Joachim Meisner was called from this earth by the God of mercy,” the Pope wrote. The Pope addressed his telegramme to Cardinal Rainer Woelki, current Archbishop of Cologne. Pope Francis closed the telegramme by imparting his Apostolic Blessing on all who “commemorate the late Pastor with prayers and sacrifices”. The Holy Father praised them for seeing one another without prejudice; an attitude, he said, that is essential “because it produces an encounter.” This encounter, he said, gives our lives meaning and purpose.